The economic health of cities and communities depends on the financial health and stability of their residents. The key: nonretirement savings. Families with a savings cushion as little as $250 to $749 are less likely to be evicted, miss a housing or utility payment, or receive public benefits after a job loss, health issue, or large income drop. Higher savings levels are associated with even lower hardship and benefit receipt. Savings are at least as important as income: low-income families with savings of $2,000 to $4,999 are more financially resilient than middle-income families without savings. The economic health of cities and communities depends on the financial health and stability of their residents. Economically secure families are better able to weather temporary income drops independently and are less likely to rely on local services for housing support and cash assistance. Financially healthy adults can contribute more to the local economy, thus supporting property, sales, and income taxes. And financially healthy families are more likely to provide the stable housing conditions and support that children need to thrive and succeed. Is increased financial health associated with decreased financial hardship? Is increased financial health associated with reduced reliance on public benefits? Families with even a small amount of nonretirement savings are less likely to be evicted, miss a housing or utility payment, or receive public benefits when income disruptions occur. The savings cushion kicks in with very low savings levels ($250–$749); for public benefits, any savings reduce benefit receipt. 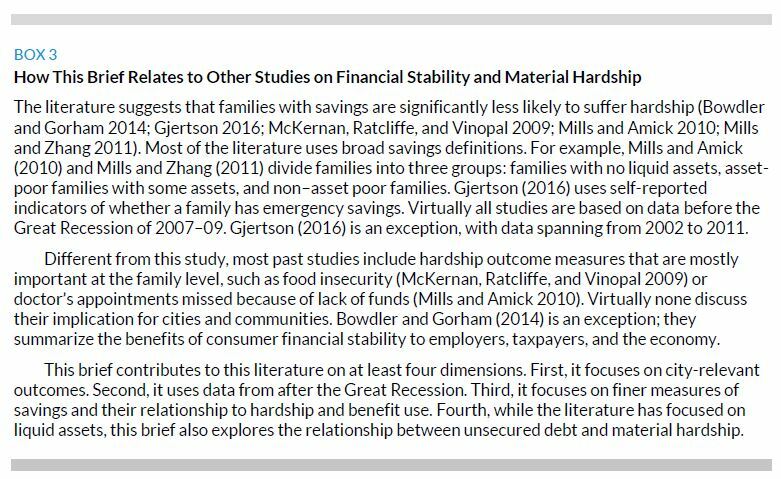 Higher savings levels, however, are associated with even lower hardship levels and benefit receipt.4 These relationships hold when taking account of family incomes. Low-income families with savings are more financially resilient than middle-income families without savings. Low-income families with savings of $2,000–$4,999 are less likely to experience a hardship after an income disruption than middle-income families with no savings. Income disruptions are common. Over 12 months, about 25 percent of families suffered at least one of the three income disruptions. Families with income disruptions are significantly more likely to be evicted, miss housing and utility payments, and receive public benefits. This issue doesn’t affect just low-income families; middle-income and higher-income families also have above-average hardship levels and benefit receipt after their income is disrupted. Many families lack a savings cushion to ease the blow when income disruptions hit. Almost 1 in 4 families have no nonretirement savings, roughly 4 in 10 have less than $750, and about 6 in 10 have less than $5,000. Savings increase with income, but low savings is not just a low-income problem. Steps to improve family financial health could improve the stability and security of both families and the communities in which those families live. Community leaders who care about resilient, inclusive, and productive communities should care about family financial health. Financially healthy families are more likely to be able to contribute consistently to local government revenues and are less likely to need city supports. Cities, counties, school districts, and other jurisdictions operate best with stable revenues and affordable expenditures. Property taxes from households and businesses accounted for roughly half (47 percent) of local own-source revenue in 2012, according to Census of Government data. Sales taxes and individual income taxes brought in an additional 11 percent and 3 percent of local own-source revenue.5 When families consistently pay their mortgage or rent they (or their landlord) are more likely to pay property taxes, which feed into city budgets. Evictions can lead to homelessness and thus local housing expenditures, which can put pressure on city budgets. These costs can be particularly high in inclement weather, especially when local areas are required to shelter the homeless.6 Homelessness among children can disrupt their education; changing schools during the school year can lower children’s long-term educational success (Ratcliffe 2015) and increase city school budgets. Families with income disruptions can have trouble paying for their utilities, such as electricity, gas, and water. 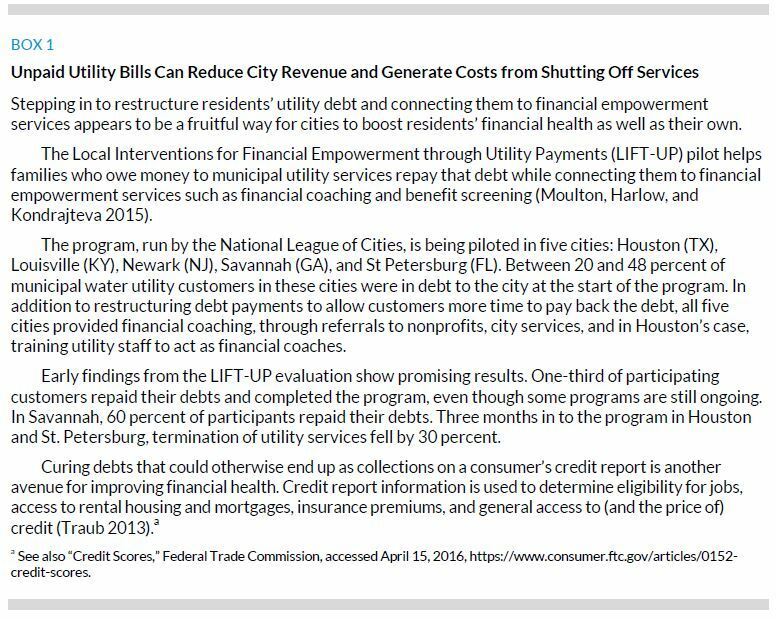 And, when utilities are city-owned, city revenues suffer when residents do not pay their bills.7 Though utility costs can be relatively small, particularly in relation to mortgage and rent, failure to pay indicates that families are struggling financially. Even small debts can balloon into large ones if families fall far behind in payments. Thus, family financial health can have direct implications for local communities and their finances. Savings are critical for weathering financial emergencies. Families with savings are more financially secure than families living paycheck to paycheck. To better understand how savings protect families, we take a closer look at families who experience one or more of three major income disruptions: an invol-untary job loss, an injury or illness that limits work, or a 50 percent drop in income. Families with higher nonretirement savings are significantly less likely to be evicted, miss a housing or utility payment, or receive public benefits after one of these income disruptions than families with lower savings. A small amount of savings can cushion the blow of income disruptions: $250–$749 helps families avoid hardship. After an income disruption, 21.1 percent of families with $1–$249 in savings miss a housing payment, compared with 15.2 percent of families with $250–$749 in savings (figure 1)—a 28 percent reduction for families with more savings. Similarly, families with $1–$249 in savings are significantly more likely to miss a utility payment than families with $250–$749 (24.5 percent versus 18.5 percent—a 24 percent reduction for families with more savings) and are more likely to be evicted (3.2 percent versus 0.7 percent—a 78 percent reduction for families with more savings). Even smaller savings amounts are associated with lower public benefit receipt. Families with just $1–$249 in savings are significantly less likely to receive public benefits than families with no savings (39.3 percent versus 47.0 percent, a nearly 20 percent reduction).9 These findings provide new evidence that savings below the asset-poverty level (roughly $5,000 for a family of three) reduce hardship and public benefit use. Higher savings are associated with even lower hardship levels. The share of families missing a housing payment falls further from 15.2 percent for families with $250–$749 in savings to 10.8 percent for families with savings of $2,000–$4,999, 6.1 percent for families with $5,000–$19,999, and 3.6 percent for families with $20,000 or more in savings. We also see missed utility payments, evictions, and public benefit receipt fall as family savings rise. We find no significant evidence that families with more unsecured debt are harder hit when an income disruption occurs.10 In fact, we find some evidence that families with unsecured debt are more self-sufficient; that is, they are less likely to receive public benefits (figure 2). Nearly one in three families (30.8 percent) with no unsecured debt receives public benefits, while only one in four families (24.7 percent) with $1–$999 in debt and one in five families (20.4 percent) with $20,000 or more in unsecured debt receive public benefits. This finding suggests that unsecured debt is related to access to credit, so families with more debt are typically more advantaged than families without debt. Savings are critical for avoiding hardships and better positioning families to contribute to their local communities, and this holds true for families at different income levels. Income matters, but low-income families with savings are better off than middle-income families without savings. In analyses that take account of income level and age, the savings cushion kicks in at $250–$749 for three outcomes—missing housing or utility payments and being evicted—and at $1–$249 for public benefits receipt (not shown).The results after adjusting for income and age continue to suggest a larger cushion against the consequences of disruptions for families with higher savings. To help further disentangle income from savings, we measure the relationship between any of our hardship measures and savings for low-income, middle-income, and higher-income families. 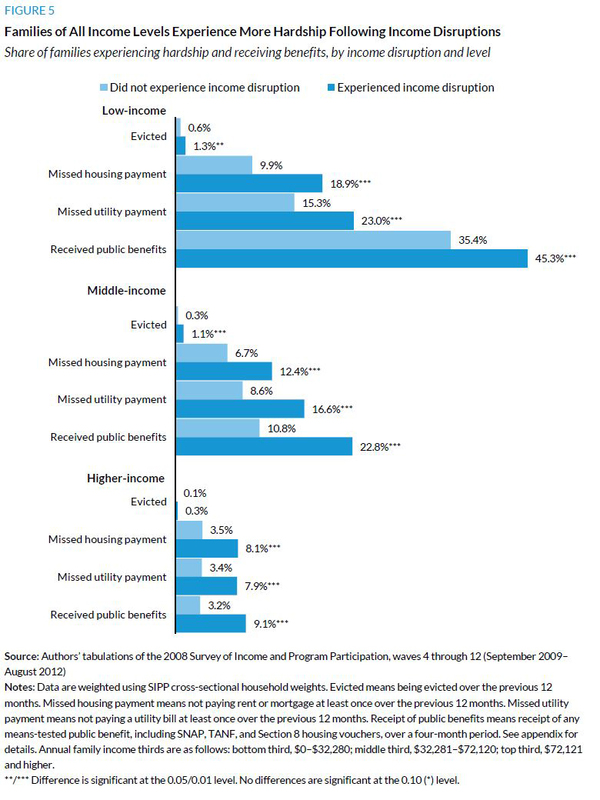 For convenience, families in the bottom, middle, and top income thirds are referred to as low-, middle-, and higher-income families. We group the savings ranges into broader groups than those used for figure 1 (and the regression analyses) because splitting the sample by income results in few families per group. The results continue to suggest that savings matter across the income distribution and that smaller amounts of savings are of greater benefit to low-income families than to higher-income families. After an income disruption, hardship is greater among low-income families without savings than similar families with savings (figure 3, left bars). For example, 37.4 percent of low-income families with no savings experience a hardship, compared with 32.4 percent of low-income families with $1–$1,999 in savings. However, hardship rates are still high for low-income families with less than $2,000 in savings; that amount is not enough to cushion nearly a third of low-income families from hardship. Above $2,000 in savings, hardship rates fall steeply and are as low as 8.6 percent for low-income families with $20,000 or more in savings. Having an adequate savings cushion is also important for the well-being of middle-income families. 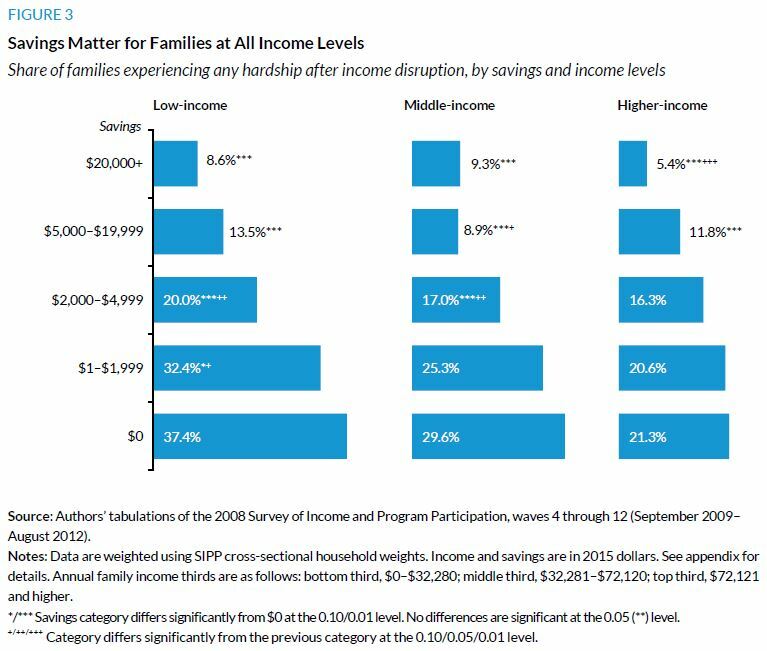 Among middle-income families whose income is disrupted, hardship is significantly higher among those with no savings than those with $2,000 or more in savings (figure 3, middle bars), suggesting that it takes at least $2,000 to protect middle-income families from hardship. Larger savings amounts continue to be associated with greater reductions in hardship.11 For example, 29.6 percent of middle-income families with no savings experience a hardship, compared with 17.0 percent of similar families with $2,000–$4,999 in savings and 9.3 percent of similar families with $20,000 or more in savings. Higher-income families need a greater savings cushion to help with potential income disruptions. Significantly more higher-income families without savings experience hardship than similar families with over $5,000 in savings,12 suggesting that it takes at least that amount to protect these families from income disruptions. Higher-income families likely need this larger cushion because their standard of living is higher, resulting in higher fixed expenses (e.g., housing costs, utility bills, vehicle loans). Among higher-income families, 21.3 percent with no savings experience hardship, compared with 11.8 percent of similar families with $5,000–$19,999 in savings and 5.4 percent with $20,000 or more in savings. Low-income families with savings are more financially resilient than middle-income families without savings. The share of families experiencing hardship after an income disruption is lower for low-income families with savings of $2,000–$4,999 (20.0 percent) than for middle-income families with no savings (29.6 percent). And the share of families experiencing hardship after an income disruption is lower for low-income families with $5,000–$19,999 saved (13.5 percent) than for middle-income families with $1–$1,999 saved (25.3 percent).This finding shows that both income and savings contribute to family well-being. We see how savings can cushion the blow of income disruptions for families at all income levels, but how often do families experience such disruptions? Roughly one in four families (25.7 percent) suffers at least one of these three income disruptions in a year (table 1). A large drop (50 percent or more) in family income is the most common, affecting 17.6 percent of families. We also find that 6.2 percent of families experience an involuntary job loss and 5.1 percent experience a health-related work limitation. Low-income families are slightly more likely to experience an income disruption, but the differences are relatively modest.13 For example, 20.6 percent of low-income families experience an income drop of 50 percent or more, compared with 15.8 percent of middle-income and 15.9 percent of higher-income families (not shown).14 Thus, emergency savings are important for families across the income distribution. 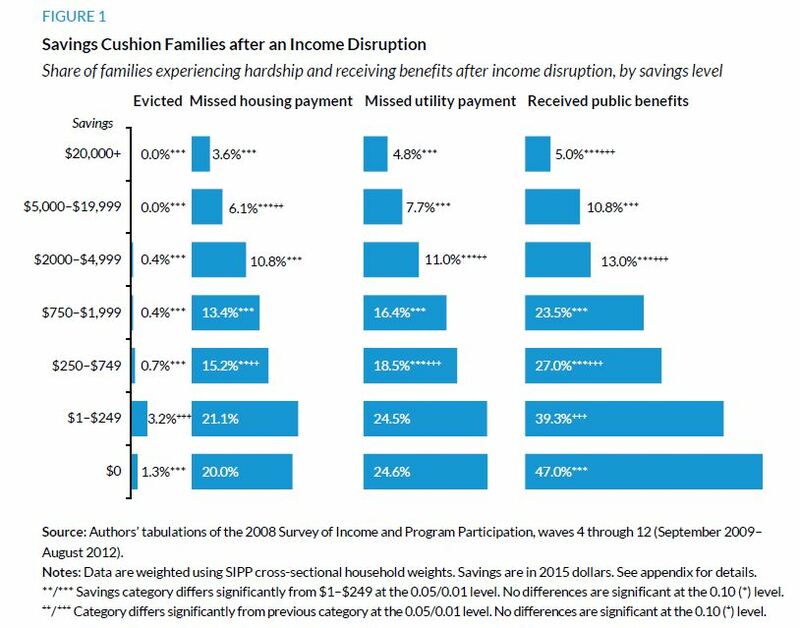 Families who experience income disruptions are significantly more likely to be evicted and miss rent, mortgage, and utility payments than those who do not experience these disruptions. With this financial strain, families are also more likely to receive public benefits, such as food, housing, and cash assistance. This higher level of hardship and benefit receipt among families who experience income disruptions holds for each disruption. 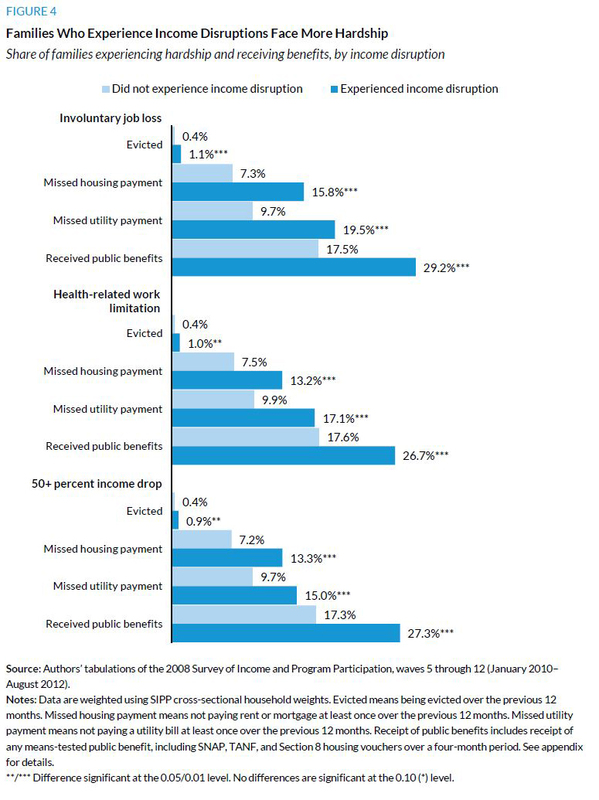 Families who lose a job are about twice as likely to miss housing and utility payments as families who do not lose a job (figure 4). Among families who lose a job, 15.8 percent miss a housing payment and 19.5 percent miss a utility payment. Among those who do not experience a job loss, the numbers are 7.3 percent and 9.7 percent, respectively. Evictions happen infrequently, but families who experience an involuntary job loss are still more likely to be evicted (1.1 percent) than families who do not (0.4 percent). When evictions happen, the ramifications can be great.15 They can lead to homelessness or force families to move to worse neighborhoods. Children may have to change schools during the school year. Even if children are able to stay in the same school, the instability of moving from place to place can still harm their ability to succeed. Residential instability can also make it difficult for parents to work or find work. Government benefit receipt is significantly higher—by over 60 percent—among families who have experienced a recent disruption. For example, 29.2 percent of families who experience an involuntary job loss receive public benefits, compared with 17.5 percent of families who do not experience a job loss. Results for the other income disruptions examined—onset of a health-related work limitation and an income drop of 50 percent or more—are similar to those above. These families, however, are slightly less likely to miss housing or utility payments. For example, about 13 percent of families with either of these two disruptions miss a housing payment versus roughly 16 percent of families with an involuntary job loss. Benefit receipt is also slightly lower for families with new health limitations or income drops than families who lose a job (27 percent versus 29 percent). The relationship between income disruptions and hardship (and benefit receipt) may differ by family income level, as income can directly affect well-being and the need for public benefits. To better understand who is vulnerable to instability, we examine income disruptions for low-income, middle-income, and higher-income families.16 Here we combine families that experience any one of the three income disruptions because figure 4 shows only modest differences between the disruptions. 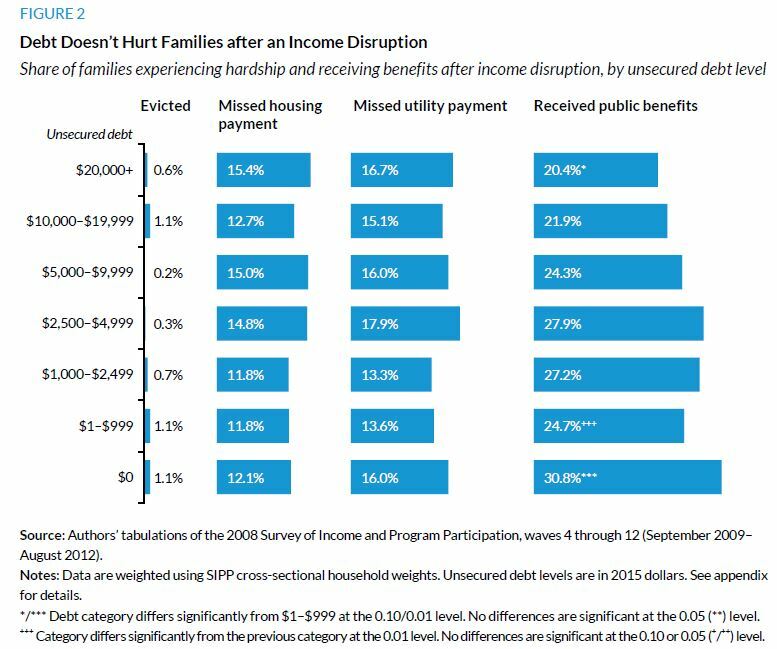 In each income group, those who experience an income disruption have higher hardship levels than families who do not (figure 5).17 Among low-income families, 18.9 percent of families who experience an income disruption miss a housing payment compared with 9.9 percent of families who do not experience an income disruption (top panel). The differences are slightly lower among middle-income and higher-income families. When looking at eviction—the most severe form of hardship—we find that income disruptions are associated with a higher share of low- and middle-income families being evicted, but not higher-income families. Some of this could reflect a larger and more financially secure network of extended family and friends among higher-income families. All three income groups saw significant differences in the likelihood of missing a utility payment or receiving public benefits when families experience an income disruption. Income disruptions are not only a concern for low-income families. To be sure, hardship is greater among low-income families—making stability particularly important for low-income families and their communities—but middle-income and higher-income families and their communities are not immune. Many families are not prepared to weather income disruptions. 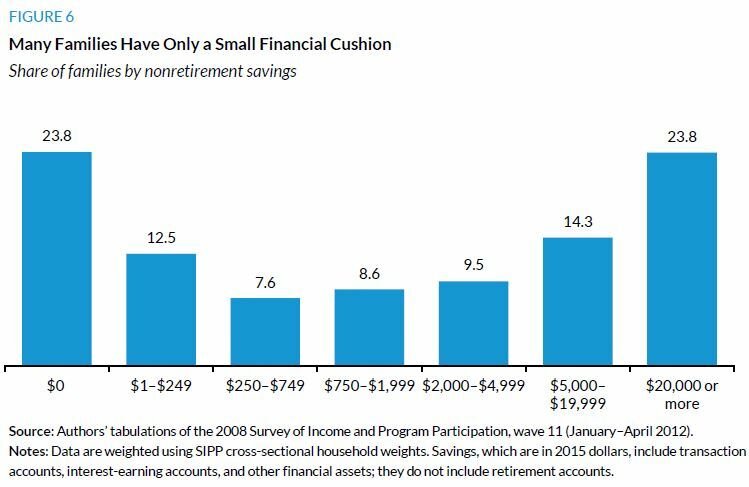 Nearly one-quarter of families (23.8 percent) have no nonretirement savings, and more than half (52.4 percent) have less than $2,000 (figure 6).18 Roughly 10 percent of families have savings between $2,000 and $5,000. In total, more than 6 in 10 families have less than $5,000 in savings, meaning that many families are financially vulnerable.19 While $5,000 in savings can help weather an income disruption, this amount will only allow a family of three to live at the federal poverty level for three months without additional resources. While the share of families with no nonretirement savings declines with income, a nontrivial share of middle-income and higher-income families have no savings. More than 4 in 10 (41 percent of) low-income families have no savings, but so do 2 in 10 (20 percent of) middle-income families and nearly 1 in 10 (8 percent of) higher-income families. Because financially healthy families can better contribute to the health of their community, savings are an important indicator for resilient communities. Families with more savings—an important component of financial health—experience less hardship than families with fewer savings. Among families who experience an involuntary job loss, a health-related work limitation, or a 50 percent drop in income, those with more nonretirement savings are less likely to be evicted, miss a housing or utility payment, or receive public benefits. The savings cushion kicks in early. It starts with $250 to $749 in assets for the three hardship measures and even earlier—with $1 to $249 in assets—for public benefit receipt. These relationships hold after accounting for age and family income. In fact, low-income families with $2,000–$4,999 in savings are better off than middle-income families with no savings. These findings reinforce the importance of savings in improving household financial health and hold important implications for local officials when crafting public policies and municipal programs. Steps by cities to improve family financial health could improve residents’ well-being, while also driving inclusive economic growth (Bernstein 2015). When residents are financially secure, they are better positioned to buy homes, support city businesses, and contribute to the local economy (Bern-stein 2015; English and Greer 2015; Marr et al. 2015; Smeeding 2014). When residents can’t meet their financial obligations, cities lose revenue and incur other costs. Unpaid property taxes in Detroit and other cities, for example, decrease city revenue and have a secondary effect through tax foreclosures. Foreclosures create other struggles and costs for cities, including neighborhood disinvestment, lower property values, and vacant property demolition costs (Dewar, Seymour, and Druta 2014).20 Unpaid utility bills reduce the revenue of city-owned utilities and generate costs from shutting off services. Evictions generate homelessness (United States Conference of Mayors 2015), which increases local housing expenditures (Tull and Macy-Hurley 2008). Evictions also lead to residential instability, which often creates further instability for families, communities, and schools (Desmond 2015). When families can navigate income disruptions, municipalities can focus social services on their hardest-to-serve families, allowing more investments in education, asset building, and workforce development. Getting families on the savings track today can also improve the prospects of the next generation if children adopt their parents’ savings habits. Cities have been using several approaches to address family financial health, many which are integrated into other programs and services. The Cities for Financial Empowerment Fund is working to integrate financial capability services in local programs. Their Financial Empowerment Centers provide one-on-one financial counseling in settings that focus on workforce development, housing services, homelessness and foreclosure prevention, domestic violence prevention, and asset building, among others. Financial coaching programs, which work one on one with clients to achieve financial goals, have been found to increase the frequency of saving (i.e., making savings deposits) and the amount of savings (Theodos et al. 2015). Integrating financial capability into public programs provides an opportunity to “meet families where they are” and address consumers’ multiple needs in order to put them on a more secure path. Working with people seeking employment services to create a household budget and set up a savings account, for example, can improve financial stability when people find jobs. Greater stability can in turn help them retain employment. Financial capability programs are one piece of a larger puzzle to help families get on firm footing. Creating financially healthy communities is an important goal of city leaders. Helping families improve their financial security can further this goal because improvements in family financial health ripple through to benefit cities and communities. To examine the role financial health plays in hardship and benefit use, we use 2009 to 2012 data from the 2008 SIPP panel. The 2008 panel includes 42,000 households and is representative of the US noninstitutionalized civilian population when weighted. SIPP respondents are interviewed every four months about the previous four months, a period referred to as a wave. We use data from the monthly SIPP core files and the SIPP topical modules. The primary unit of analysis for this study is a household, which we refer to as a family for simplicity. Hardship and public benefit receipt. Our measures of hardship are indicators for whether a family missed a mortgage or rent payment, was evicted, or did not pay utility bills. This information comes from the adult well-being topical module where respondents are asked to report incidents of hardship that occurred over the past year. A family is defined as using public benefits in a month if anyone in the family received a means-tested benefit. Benefit receipt is available in the core data. Income. To help disentangle the role of assets from income, we examine individuals in the bottom, middle, and top thirds of the family income distribution. Families in the bottom third of the income distribution have annual incomes of $32,280 or less in 2015 dollars. Families in the middle third of the distribution have annual incomes between $32,281and $72,120, and families in the top third have annual incomes above $72,120. We refer to these families as low-income, middle-income, and higher-income. Family income is available in the monthly core data. Income disruptions. We examine three income disruptions that may require a family to rely on savings: the family head or his/her spouse experiences an involuntary job loss, head or spouse experiences the onset of a health-related work limitation, and family income drops at least 50 percent. These examples do not define all disruptions, which can also include expenses such as a new child in the family or an unexpected bill (e.g., medical, car repair). The variables are generated from the monthly core data. Savings and debts. To assess family financial health, we examine their assets and debts, which are measured in the asset and liability topical module. For assets, we focus on nonretirement savings, which capture the value of transaction accounts, interest-earning accounts such as certificates of deposit and money market accounts, mutual funds, savings bonds, US securities, stocks, and other financial assets (but excludes money held in retirement accounts). For debts, we focus on unsecured debt, which includes debts such as credit card debt, installment loans, and student loans. Unsecured debt excludes debts that can be paid off by selling the asset securing it (e.g., vehicle loans and mortgages), so better measures economic distress. Savings and debts measure objective components of financial health and well-being. The Consumer Financial Protection Bureau provides a tool to measure subjective components of well-being that we are unable to capture with our data. See http://www.consumerfinance.gov/newsroom/cfpb-releases-tool-to-help-measure-financial-well-being/. Timing. The timing of the analysis is structured partly around the availability of information on families’ savings and debts, hardship, and public benefit receipt during the SIPP panels. In the hardship analyses, we look at a family over two years, captured in waves 4–9 of the SIPP. We measure the family’ savings and debts at the beginning of the first year (wave 4). An income disruption is measured over the next eight months (waves 5 or 6). We then measure the family’s hardship during the following 12 months (waves 7, 8, and 9). For the public benefit analysis, we look at families over one year. We measure their savings and debts at the beginning of the year (which could be wave 4, 7, or 10), the income disruption in the next four months (waves 5, 8, and 11, respectively) and public assistance receipt in the next four months (waves 6, 9, and 12, respectively). In total, our hardship analyses sample includes 28,000 families, and the public benefit analysis sample includes 89,000 family-year observations. Azurdia, Gilda, Freedman, Stephen, Hamilton, Gayle, and Schultz, Caroline. 2014. Encouraging Low- and Moderate-Income Tax Filers to Save: Implementation and Interim Impact Findings from the Save USA Evaluation. New York: MDRC. Belser, Denise, and Michael Karpman. 2013. “Cities to Assist Families in Debt to Public Utilities through NLC’s New LIFT-UP Initiative.” Washington, DC: National League of Cities. Bernstein, Jared. 2015. “Financial Vulnerability Is a Problem: An Economist’s View.” In What It’s Worth: Strengthening the Financial Futures of Families, Communities, and the Nation, edited by Laura Choi, David Erickson, Kate Griffin, Andrea Levere, and Ellen Seidman, 72–84. San Francisco: Federal Reserve Bank of San Francisco and Corporation for Enterprise Development. Bowdler, Janis L., and Lucy S. Gorham. 2014. All In: Building the Path to Global Prosperity through Financial Capability and Inclusion. New York: JPMorgan Chase. Cannon, Matt. 2015. “National Property Tax Delinquency Declining” Irvine, CA: CoreLogic. CFPB (Consumer Financial Protection Bureau). 2015. Financial Well-Being: The Goal of Financial Education. Washington, DC: CFPB. Desmond, Matthew. 2015. “Unaffordable America: Poverty, Housing, and Eviction.” Fast Focus 22-2015. Madison: Institute for Research on Poverty, University of Wisconsin–Madison. Dewar, Margaret, Eric Seymour, and Oana Druta. 2015. 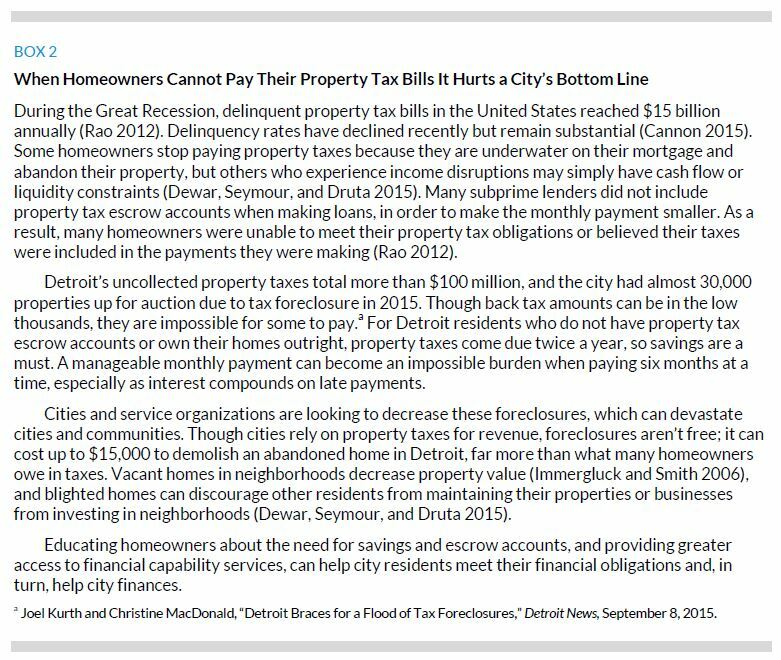 “Disinvesting in the City: The Role of Tax Foreclosure in Detroit.” Urban Affairs Review 51 (5): 587–615. English, Phil, and Jeramie Greer. 2015. “We Are In This Together: Bipartisan Solutions to Preserve the American Dream.” In What It’s Worth: Strengthening the Financial Futures of Families, Communities, and the Nation, edited by Laura Choi, David Erickson, Kate Griffin, Andrea Levere, and Ellen Seidman, 85–92. San Francisco: Federal Reserve Bank of San Francisco and Corporation for Enterprise Development. Farrell, Diana, and Fiona Grieg. 2015. Weathering Volatility: Big Data on the Financial Ups and Downs of US Individuals. Washington, DC: JPMorgan Chase Institute. Gjertson, Leah. 2016. “Emergency Saving and Household Hardship.” Journal of Family and Economic Issues 37 (1): 1–17. Gutman, Aliza, Thea Garon, Jeanne Hogarth, and Rachel Schneider. 2015. Understanding and Improving Consumer Financial Heath in America. Chicago: Center for Financial Services Innovation. Hannagan, Anthony, and Jonathan Morduch. 2015. “Income Gains and Month-to-Month Income Volatility: Household Evidence from the US Financial Diaries.” US Financial Diaries Project working paper. New York: Financial Access Initiative, New York University, and Center for Financial Services Innovation. Immergluck, Dan, and Geoff Smith. 2006. “The External Costs of Foreclosure: The Impact of Single-Family Mortgage Foreclosures on Property Values.” Housing Policy Debate 17 (1):57–79. Marr, Chuch, Chye-Ching Huang, Arloc Sherman, and Brandon Debot. 2015. “EITC and Child Tax Credit Promote Work, Reduce Poverty, and Support Children’s Development, Research Finds.” Washington, DC: Center on Budget and Policy Priorities. McKernan, Signe-Mary, Caroline Ratcliffe, and Katie Vinopal. 2009. “Do Assets Help Families Cope with Adverse Events?” Perspectives on Low-Income Working Families Brief 10. Washington, DC: Urban Institute. Mills, Gregory, and Joe Amick. 2010. “Can Savings Help Overcome Income Instability?” Perspectives on Low-Income Working Families Brief 18. Washington, DC: Urban Institute. Mills, Gregory, and Sisi Zhang. 2011. “Savings and Hardship Avoidance among Households Headed by People with Disabilities: Implications for SSI.” Washington, DC: Urban Institute. Rao, John. 2012. “The Other Foreclosure Crisis: Property Tax Lien Sales.” Boston: National Consumer Law Center. Ratcliffe, Caroline. 2015. “Child Poverty and Adult Success.” Washington, DC: Urban Institute. Smeeding, Timothy. 2014. “Multiple Barriers to Economic Opportunity in the United States.” Paper presented at the Boston Federal Reserve Conference on Inequality of Economic Opportunity, Boston, October 17. Theodos, Brett, Margaret Simms, Mark Treskon, Christina Plerhoples Stacy, Rachel Brash, Dina Emam, Rebecca Daniels, and Juan Collazos. 2015. An Evaluation of the Impacts and Implementation Approaches of Financial Coaching Programs. Washington: DC: Urban Institute. Traub, Amy. 2013. “Discredited: How Employment Credit Checks Keep Qualified Workers Out of a Job.” New York: Demos. Tull, Tanya, and Ryan Macy-Hurley. 2008. “Alternatives to Shelter in Ending Family Homelessness” Los Angeles: Institute for Research, Training and Technical Assistance, Beyond Shelter. United States Conference of Mayors. 2015. Hunger and Homelessness Survey: A Status Report on Hunger and Homelessness in America’s Cities. Washington, DC: United States Conference of Mayors. Wiedrich, Kasey, Lebaron Sims, Holden Weisman, Solana Rice, and Jennifer Brooks. 2016. The Steep Climb to Economic Opportunity for Vulnerable Families. Washington, DC: Corporation for Enterprise Development. Signe-Mary McKernan is a national wealth-building and poverty expert with nearly two decades of experience researching access to assets and credit and the impact of safety net programs. She directs the Urban Institute’s Opportunity and Ownership Initiative and published the book Asset Building and Low-Income Families with Michael Sherraden. She advised the Consumer Financial Protection Bureau in setting up a first-rate research unit. Before joining the Urban Institute in 1999, she was lead economist on credit issues at the Federal Trade Commission. She has been a visiting and adjunct professor at Georgetown University. Her research has been published in refereed journals including the American Economic Review Papers and Proceedings, Demography, and Review of Economics and Statistics. She has testified before Congress, appeared on NBC4 (Washington, DC) and Al Jazeera, and been cited in media outlets such as the New York Times, Washington Post, Forbes, and Time. She has a PhD in economics from Brown University. Caroline Ratcliffe is a senior fellow and economist in the Center on Labor, Human Services, and Population at the Urban Institute. An expert on asset building and poverty, she has published and spoken extensively on poverty, the role of emergency savings, consumer use of alternative financial sector products, and welfare programs and policies. Ratcliffe testified before the US House Committee on Agriculture and the District of Columbia's City Council on persistent child poverty. She also provided testimony before the US Senate Small Business and Entrepreneurship Committee on closing the racial wealth gap. She serves on the Aspen Institute's advisory group for its Expanding Prosperity Impact Collaborative. Her research has published in numerous academic journals and has been cited in elite media outlets, including the Economist, New York Times, Washington Post, and Wall Street Journal, and she has appeared on C-SPAN, Al Jazeera America, NPR, and Marketplace. She holds a PhD in economics from Cornell University. Breno Braga is a research associate in the Center on Labor, Human Services, and Population at the Urban Institute. He has a PhD in economics from the University of Michigan, Ann Arbor. Emma Kalish is a research associate in the Center on Labor, Human Services, and Population at the Urban Institute, where her research interests include poverty and child welfare. Kalish graduated from Macalester College with a degree in economics and urban studies. We thank Don Baylor, Janis Bowdler, Colleen Briggs, Liza Getsinger, Ellen Seidman, Brett Theodos, and Margery Turner for helpful suggestions. We are also grateful to Serena Lei and Fiona Blackshaw for excellent writing and editing support and Hannah Recht for beautiful graphics.